French Emblems: Emblem: Adulator saluti reipublicae gravis. The flatterer is damaging to the health of the commonwealth. Rex viru regnum vacuat gravi. As the Lion, whom the savage strength of blind sickness is weakening, Feels his vigour swiftly renewed, if he eats the Monkey: So a king who casts from his hall the toady and the dreadful sycophant rids his kingdom of a grave sickness. eum agunt. Confirmaet [=Confirmat] idem & Philostratus lib. vium excitatur, molestaque saburra exoneratur. cuncta redire posse, non iniqua spes est. Horapollo, the author of the Hieroglyphica, says that when the Lion falls ill with a fever (and this feverish sickness is a familiar one to that beast, even occurring every fourth day, if Philes, who wrote a poem on animals in Greek, is to be believed) his custom is to feed off a monkey, for a source of most health-giving food. Pliny does not contradict this, except to say that as the Lion fights off the fever, he feels a nauseous distaste for food, of which he cures himself by tasting the blood of monkeys, which drive him into a rage because of their excessive lewd behaviour. Philostratus too, in bk. 3 of the Life of Apollonius, confirms the same thing, writing that Lions lie in ambush for monkeys on account of their medicinal properties. Indeed, Aelian, in bk. 1, ch. 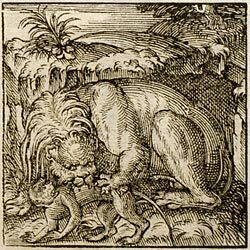 9 of his [p.102] universal natural history, also writes that other remedies are of no use to a sick lion, but only the monkey, by eating which the lion will recover its full strength. The same writer bk. 5, ch. 39 of his books On the Animals gives an account of the cure and a rather different analysis of the sickness in [more or less] these words: a Lion, he says, that has overeaten, looks for a remedy, either curing itself by peace and quiet and a period of abstinence, or, having caught a monkey, by eating it; and this food causes an overflowing of the belly, whereby the painful load is discharged. * The monkeys can be very aptly compared to the impostors, yes-men and parasites, who speak flatteries and craftily ensnare the ears of princes: indeed Aristophanes calls demopithekoi [or ‘mob-monkeys’] those people who speak flatteries to and sweet-talk the crowd, since the Greek language uses the word pithekizein [i.e. ‘simiari’: to play the monkey], to mean ‘to deceive’. For that beast is expertly skilled at imitating everything. But if some prince should drive out these pests from his court, by golly he has mucked out an Augean stable, and deserves to be called a tamer of monsters, along with Hercules and Constantine: for this is what Aurelius Victor called Constantine, who was in the habit of referring to those damnable courtiers as palace moths [or woodworms] and shrews, as Anaxilaus called them the worms of wealth. When they have been dealt with and [p.103] driven out, it is not unreasonable to hope that it might be possible to have everything safe and sound, and sane, once more. * Saburra: strictly speaking, a load of sand, for ballast in a ship; the related word saburratus was occasionally used comically to mean ‘stuffed’. 1. Reading Alcmanio for Alemanio. For Alcman and Alcmanian verse, see emblems XII ([FJUb012]) and XIX ([FJUb019]). 2. The identity of the poet Philes is uncertain, possibly the 13th-century Byzantine poet. 3. The fourth-century (and mightily unreliable) imperial historian. 4. Anaxilaus of Larissa, physician and Pythagorean philosopher, 1st century BC, banished from Rome for practicing magic.